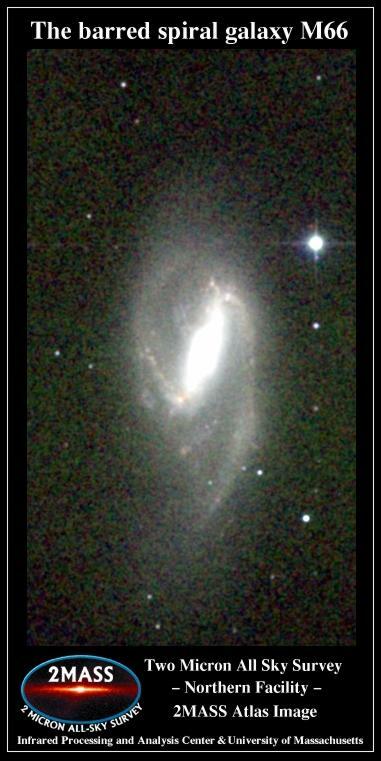 This image of spiral galaxy M66 in constellation Leo was taken with the KPNO 0.9-meter telescope on the nights of December 19th and 20th 2002 UT. 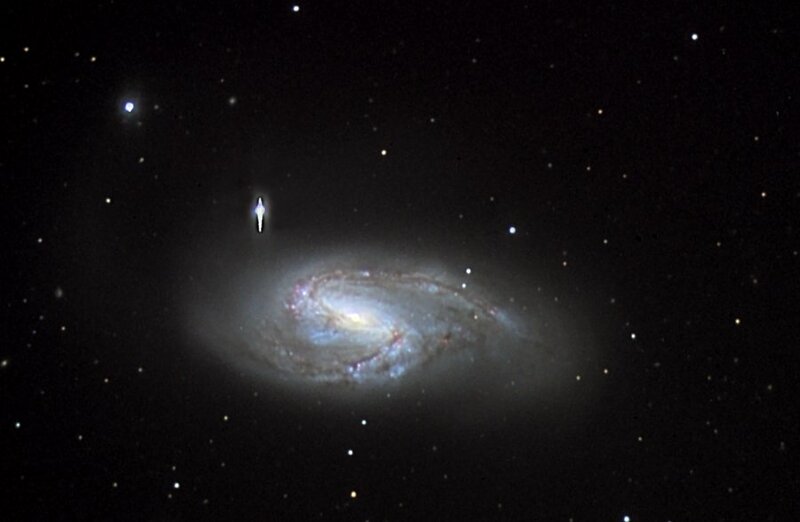 The spiral arms of M66 look somewhat distorted, an effect of the gravitational interaction with its neighbors, M65 and NGC 3628. During their participation in the Advanced Observer Program of the Kitt Peak National Observatory (KPNO) Visitor Center, Glenn Hitchcock and Bob Cowart took this beautiful color image of spiral galaxy M66 in Leo. It was obtained with the AOP's Meade 16-inch LX200 telescope operating at f/6.3 and SBIG ST8E CCD camera with color filter wheel. Adam Block did the processing of this image: One iteration of L-R deconvolution (sharpening) algorithm using CCDsharp was applied to the luminance image. The new Digital Developement (DDP) method via Maxim/DL was also used in order to display the very dim and very bright details of the image simultaneously. This is a composite of 4 CCD images: Luminance = 48 minutes, binned 1x1. Red = 10 minutes, Green = 10 minutes, and Blue = 20 minutes, binned 3x3 each. M66 is a distorted spiral galaxy in the constellation of Leo. It is being tugged on by its nearby neighbors M65 and NGC 3628. 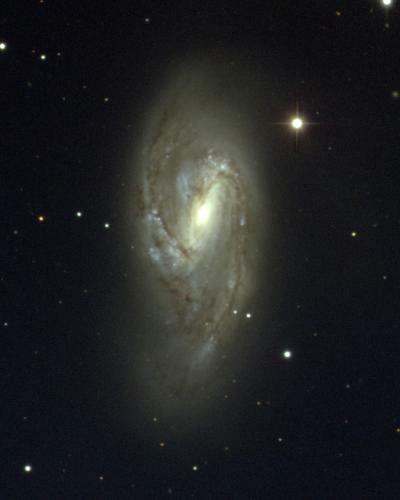 In fact, the arms of this galaxy appear to rise above the main disk. The many bright blue and pink regions indicate the active star forming regions. M66 and the other galaxies in this group are estimated to be 35 million light years away. 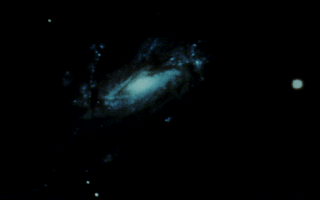 IR image of spiral galaxy Messier 66, taken with the 2MASS IR telescopes. This is a false-color IR image coding different IR wavelength bands into colors, with coolest/longest red and "hottest" or warmest/shortest blue.